6 Ions can pass through a single membrane channel at a rate of 10 ions/second. Over the last decade the ability to measure ion flux so precisely and to document the opening and closing of individual ion channels has provided a powerful tool to those working on smooth muscle physiology and vascular reactivity. 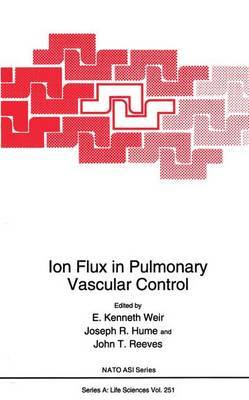 The use of potassium channel blockers by Tom Lloyd in the 1960s and calcium channel blockers by Ivan McMurtry in the 1970s indicated the importance of ion flux in regulating pulmonary vascular tone. Recent advances in technology. principally the patch-clamp technique and fluorescent ion-sensitive dyes. now permit a more detailed description of physiologic mechanisms. This volume arises from the Sixth Grover Conference on the Pulmonary Circulation. a NATO Advanced Research Workshop. held in Colorado in October 1992. A group of international sCientists who are leaders in the field of ion flux focused their attention on the problems of the pulmonary vasculature. The chapters in this book describe the present state of knowledge of the movement and storage of ions in vascular endothelial and smooth muscle cells. Those who are not familiar with the techniques of patch clamping and calcium imaging will find an introduction to these methods in the chapters by Leblanc and Wan and Archer et al. The role of potassium channels in oxygen sensing illustrates the rapid progress which the study of ion currents has made possible.